Sir Blewain was trampled to death by his own charger in the stables during the Year of Our Lord 483, may he rest in peace. 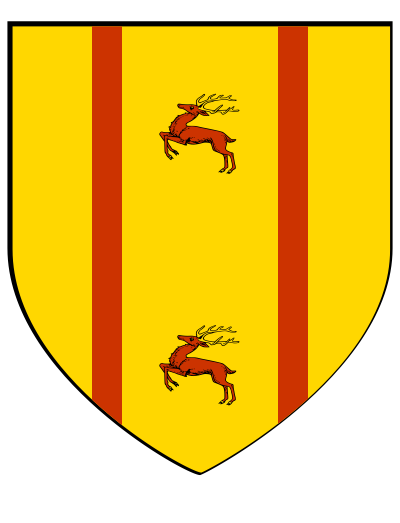 The elder landlord of Shefford was known more as a diplomat for King Uther than for his valor on the field of battle. Sir Blewain was instrumental in negotiating the vassalage of Duke Caercolun to King Uther when the King first ascended to the throne. Sir Blewain's untimely death was a great blow to King Uther, particularly considering Duke Cornwall's rebelliousness of late. At the start of the game Sir Bleger is still a squire (GM's player character). Squire Bleger is knighted when he reaches his majority in 685. Squire Bleger is an ungainly mountain of a lad. Hair covers his body nearly like a beast. His feet are so large that special stirrups were needed for him to comfortably fit his saddle. Many take him to be slow witted. Those who speak to him, however, are often greatly surprised at his great eloquence and knowledge of classical literature. Squire Bleger is eager to wear the sword of his great grandfather Sir Bleger the Elder, a bronze roman gladius passed down from a centurion ancestor from the time when Britain first was won for the empire. The murder of his cousin and best friend, Sir Omig, at the Battle of Mount Damen sits uneasy with Squire Bleger. Although Squire Bleger is normally merciful and kind, his mercy tends to fall short when Saxons are involved.